Currently a correspondent on The Daily Show with Trevor Noah, Roy Wood Jr. has been described by the Hollywood Reporter as “A Standout” and Entertainment Weekly called his brand of thought provoking comedy as “charismatic crankiness.” Wood recently premiered his first one-hour stand-up special, Father Figure, on Comedy Central and a live album of the same name. He was also named the new host for Season 4 of Comedy Central’s storytelling series, This is Not Happening. Wood’s comedy has entertained millions across stage, television and radio. Prior to The Daily Show, Wood starred for three seasons season on TBS’ Sullivan & Son. He made his network television debut on The Late Show with David Letterman and went on to appear on HBO’s historic Def Comedy Jam. Roy was selected by America as one of the top three finalists on NBC’s Last Comic Standing (2010). Wood has made appearances on numerous television shows including The Late Late Show with Craig Ferguson, Conan, The Tonight Show starring Jimmy Fallon, Late Night with Seth Meyers, and The Late Show with Stephen Colbert. In addition, Roy has been a regular contributor to ESPN’s Sports Nation. 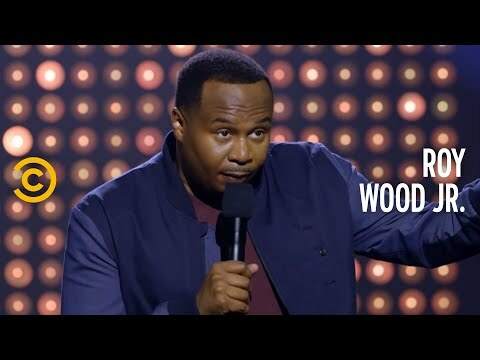 Roy Wood Jr. is known for his prank calls which he has done for over a decade on various radio morning shows including the nationally syndicated Bob and Tom Show. Roy has recorded three nationally-released prank call CDs and a full comedy CD titled Things I Think, I Think.